Liquid-Plumr Hair Clog Eliminator Hair is the number one cause of plugged drains. With Liquid-Plumr Hair Clog Eliminator, hair clogs are destroyed as the thick gel coats and sticks to hair, dissolving clogs and clearing the drain. Just pour, wait 15 minutes and flush to remove tough hair clogs. This powerful drain cleaner is safe for septic systems and all pipes, including PVC, plastic, copper and old pipes. Keep your drains clear with Liquid-Plumr. A true breakthrough in drain opening technology. This fast acting Ultimate Main Drain Opener product offers superior performance over traditional drain openers, and is biodegradable and non-irritating to skin. Its high density, thickened formula is heavier then water, so it sinks and clings to the blockage and begins working quickly. Highly effective against obstructions caused by fats, oils, lint, and hair. Green Gobbler Main Drain Opener is odourless, non-flammable, and safer to use then traditional drain openers. Green Gobbler eco-friendly drain cleaner uses a unique formula to break down and liquefy grease, fats, paper, hair and other organic materials. It's great to use in all sink drains, showers and tubs, garbage disposals and even toilets. This powerful product is also environmentally friendly, safe to use and completely biodegradable. Its unique delivery system makes it easy to figure out how much to use, simply tear open one Pac and pour entire contents into affected drain. A true breakthrough in drain opener technology. The fast-acting Dissolve Drain Clog Remover offers superior performance over traditional drain openers, and is biodegradable as well as non-irritating to skin. Its high density, thickened formula is heavier than water, so it sinks and clings to the blockage and begins working quickly. Highly effective against grease, hair, soap scum and fats. Green Gobbler Dissolve Drain Clog Remover is odorless, nonflammable, and safer to use than traditional drain openers. 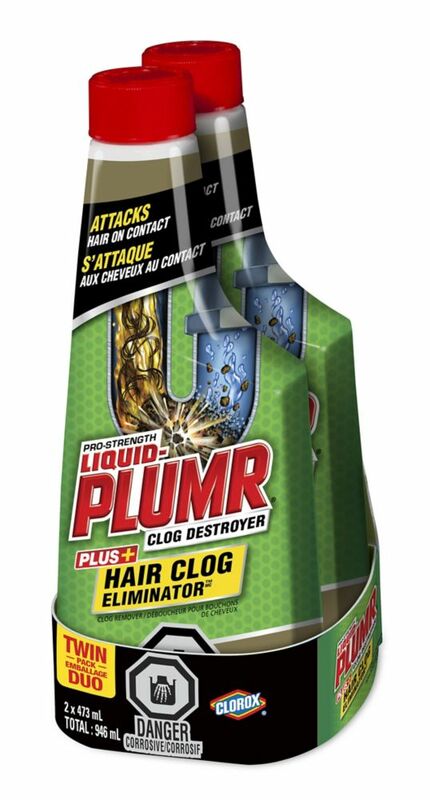 Hair Clog Eliminator Liquid-Plumr Hair Clog Eliminator Hair is the number one cause of plugged drains. With Liquid-Plumr Hair Clog Eliminator, hair clogs are destroyed as the thick gel coats and sticks to hair, dissolving clogs and clearing the drain. Just pour, wait 15 minutes and flush to remove tough hair clogs. This powerful drain cleaner is safe for septic systems and all pipes, including PVC, plastic, copper and old pipes. Keep your drains clear with Liquid-Plumr.